Look, it's Noah, the emergency backup Bob. Noah was another character created for the show. He was introduced at the hospital where Beth woke up, but eventually made his way into the main group (after robbing them and then needing to be saved by them). Still, he's more memorable for his death than anything he did while alive - if you don't remember Noah, he's the poor kid who got stuck in the revolving door when Glenn's arch-rival Nicholas proved to be an idiot and a coward. It's hardly surprising there's no "dead" variant of Noah, considering just how gruesome his end was. Noah is younger than Bob, and has shaggier hair. The look on his face is one of surprise. 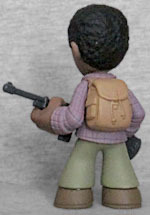 He's got his brown backpack, and is carrying a dark grey rifle - it's a molded part of his right hand, and his left hand is open wide enough to cradle the front end. He's wearing a purple plaid shirt, which is easily identified by the sculpted lines that represent the pattern. His white shirt has a few thin lines painted on to serve as dirt/wrinkles, and his green pants have seams and stitches down the side. 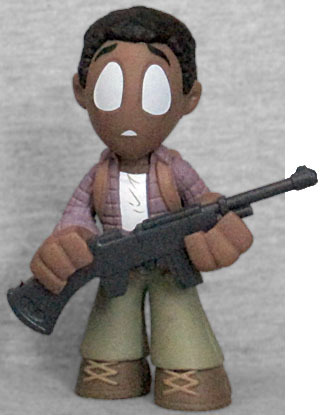 The Walking Dead may not have much love for its black cast members, but Funko's Walking Dead Mystery Minis sure do.